The Mitsubishi MU-2 is one of postwar Japan's most successful aircraft. It is a high-wing, twin-engine turboprop, and has a pressurized cabin. Work on the MU-2, Mitsubishi's first postwar aircraft design, began in 1956. Designed as a light twin turboprop transport suitable for a variety of civil and military roles, the MU-2 first flew on 14 September 1963. This first MU-2, and the three MU-2As built, were powered by Turbomeca Astazou turboprop. In 1965, Mitsubishi established a production facility for North American MU-2 buyers in San Angelo, Texas. When MU-2 production ended in 1986, aircraft were no longer assembled in Japan. Instead, the San Angelo Mitsubishi International factory had been building aircraft using American avionics and airframe components shipped from Mitsubishi's facilities in Japan. Over 750 MU-2 aircraft were sold. The subsequent production aircraft, designated MU-2B, were delivered with the Garrett TPE331 engines that remained standard on all later models. 34 MU-2Bs were built, followed by 18 examples of the similar MU-2D. The Japanese armed forces purchased four unpressurized MU-2Cs and 16 search and rescue variants designated MU-2E. Featuring slightly more powerful upgraded TPE331 engines, 95 examples of the MU-2F were sold. The fuselage was stretched beginning with the MU-2G; these aircraft are covered in later paragraphs. The MU-2M (only 28 built) is regarded as the toughest and most desired of all short body MU-2s, especially with a -10 engine conversion. It had a short fuselage and the same engines as the stretched MU-2J; it was followed by the even more powerful MU-2K and later the MU-2P, which had newer four-blade propellers. The final short-fuselage MU-2s produced were known as the Solitaire and were fitted with 496 kW (665 shp) Garret TPE331-10-501M engines. The first significant change to the airframe came with the stretched MU-2G, first flying 10 January 1969, which featured a 1.91 m (6 ft 3 in) longer fuselage than earlier models; 46 were built before being succeeded by the more powerful MU-2J (108 constructed). The MU-2L (29 built) was a higher-gross-weight variant, followed by the MU-2N (39 built) with uprated engines and four-blade propellers. The final stretched-fuselage MU-2 was named the Marquise, and like the Solitaire used 533 kW (715 shp) TPE331 engines. As of 2005, 397 MU-2 aircraft are registered in the United States. Picture - A military version for JGSDF. MU-2s are currently flown under government contract at Tyndall Air Force Base, Florida, where they provide U.S. Air Force undergraduate Air Battle Manager students with their initial experience controlling live aircraft. Students must control eight MU-2 missions before they can progress to controlling high performance aircraft such as F-15s or F-22s. The Royal New Zealand Air Force announced 29 July 2009 that it will take delivery of four non-flying Mitsubishi MU-2F fixed-wing training aircraft during third quarter 2009 for use as training aids. The aircraft will be located at the RNZAF's Ground Training Wing (GTW) at Woodbourne near Blenheim. Like all aircraft, the safety record of the MU-2 has been examined by government agencies and found to be acceptable when compared to other aircraft in its class; it was involved in 11 accidents with a total of 12 fatalities in a single 18-month period. Also, as reported by CNBC, there have been a total of 330 fatalities from MU-2 crashes. However, there have been years where the MU-2 had no accidents at all. As of October 2005, the Federal Aviation Administration (FAA) has begun a safety evaluation of the aircraft and decided that the aircraft has met its certification requirements - it is safe when operated by properly trained pilots who operate properly maintained aircraft. The FAA is in the process of mandating training specific to the MU-2 as it has in the past for other aircraft. When such mandated training was required outside of the U.S. the MU-2 accident record was vastly improved. Because the MU-2 offers very high performance at a relatively low cost, some of its operators lack sufficient training and experience for such an advanced aircraft. A design feature of the MU-2 is its high cruise speed while having a low landing speed. This is accomplished by using full-span, double-slotted flaps on the trailing edge of the wing. These flaps give the MU-2 a wing area comparable to a Beech King Air in landing configuration while having a wing area comparable to a light jet while in cruise mode. The full-span flaps meant that over-wing spoilers were employed instead of conventional ailerons. These spoilers are highly effective, even when the MU-2 wing is stalled. Some fatal accidents have occurred because normal engine-out procedures for light twin aircraft are not effective when flying the MU-2. The commonly taught procedure of reducing flap following an engine failure on take off leads to a critical reduction in lift in the MU-2 due to the highly effective double-slotted flaps. When pilots were taught to retain take-off flap and to reduce climb rate in the event of an engine failure, MU-2 accident rates reduced to almost nil. The FAA began an aggressive safety evaluation in July 2005. The evaluation is performing a detailed review of accidents, incidents, airworthiness directives, service difficulty reports, safety recommendations and safety reports. It also is examining pilot training requirements, the history of the aircraft's commercial operators and possible engine problems. The goal is to identify the root causes of MU-2 accidents and incidents and determine what, if any, additional safety actions are needed. In early 2008, the FAA issued a Special Federal Air Regulation (SFAR) directed at MU-2B operations. Pilots flying this aircraft after that date (current MU-2 pilots would have a year to come into compliance) were required to receive type-specific initial training, as well as recurrent training. It also required that a fully-functional autopilot be available for single-pilot operations, and that FAA-approved checklists and operating manuals be on board at all times. Also unusual for this SFAR, pilot experience in other aircraft types cannot be used to comply with MU-2 operational requirements - for instance, the requirement to perform landings within the preceding 90 calendar days before carrying passengers is altered by this SFAR to require those landings be made in the MU-2. There is no regulatory relationship between the SFAR requirements and a Type Rating, however both have completion standards located in the practical test standards. The SFAR requires specific training, currency, and operational requirements. Upon completion of the training requirements the instructor places an endorsement in the pilot's logbook if the instructor feels that the pilot has met the completions standards outlined in the commercial and instrument PTS. If not, training continues until the pilot meets the minimum standards. In comparison, an FAA Type Rating requires the pilot to complete qualified training followed by a checkride and oral examination by an FAA designated examiner. During a Type Rating checkride the pilot must perform all portions of the ride to a mimimum of the ATP practical test standards (regardless of the category of airman certificate held). A Type Rating becomes part of the pilot's airman certificate. 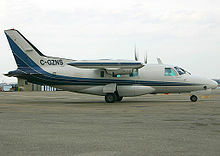 On 19 march 1998,an MU-2-2B-60 of Air 500 landing at Quebec Airport crashed during approach and then there was a strong explosion that destroyed the plane and killed all occupants. On 18 January 2010, an MU-2-2B-60 crashed on approach to Lorain County Regional Airport, killing three. Taylor, John W.R. (1976). Jane's All The World's Aircraft 1976-77. London: Jane's Yearbooks. ISBN 0 354 00538 3.